DDD. It’s probably the most impressive of all exome sequencing studies of 2014 and I almost missed it. Late December last year, the Deciphering Developmental Disorders study was published in Nature, reporting the genetic findings in more than 1,000 patient-parent trios, which were collected in a systematic nation-wide approach in the United Kingdom and Ireland. The analysis of more than 1,600 de novo mutations in this cohort provides another fascinating view into the genetics of neurodevelopmental disorders, independently confirming the role of DNM1 and pointing out several genes that act through either activating or dominant-negative mutations. Let me guide you through a study that comes to the sobering conclusion that even entire nations are too small to understand the genetics of neurodevelopmental disease. Decipher. The DDD(UK) study is aligned with the Welcome Trust and Decipher, a growing database of genetic variants in genetic disorders that is conveniently linked into common gene browser such as the UCSC genome browser. The DDD(UK) study drew upon a heterogeneous patient population with the aim to provide a genome-wide first approach to neurodevelopmental disorders, appreciating the overlap between these conditions. Most patients in the DDD cohort had intellectual disability (~90%) and roughly one quarter of patients had seizures. Accordingly, with respect to epilepsy or seizures alone, we’re already looking at a study of the magnitude of the initial Epi4K study, which may provide us with the power of this study. The known 28%. In total 317 children were found to have mutations in established genes for neurodevelopmental disorders published prior to November 2013. This percentage pretty much equals the frequency found in other cohorts of patients with neurodevelopmental disorders and would be the frequency that we would pick up with a gene panel. Interestingly, the authors observe that most genes were only observed once and that only eight genes accounted for roughly 1% of patients each. These genes included SCN1A, STXBP1, SYNGAP1, ANKRD11, DYRK1A, MED13L, ARID1B, and SATB2, covering many of the known genes overlapping between human epilepsies and neurodevelopmental disorders. It is interesting to see that neither SCN2A, SCN8A nor CDKL5 made it on this list, possibly indicating that the phenotypes in the DDD cohort were biased towards milder epilepsies and not epileptic encephalopathies. While this finding was reassuring, the DDD got interesting when the authors looked at new genes, which were significantly enriched for de novo mutations. The list of research genes. The authors provide a list of variants that they believe to be pathogenic, but lack sufficient prior evidence (link). In summary, 12 novel genes made the cut for being significantly enriched in the DDD cohort. These genes included a few known suspects as well as several entirely knew genes. Most prominently, the DDD study identified three additional patients with de novo mutations in DNM1 coding for Dynamin 1. As you might remember, DNM1 mutations in epileptic encephalopathies were one of the main findings in our E2 study and we are currently examining the phenotypes of the DNM1 patients in more detail. I have taken up the DDD researchers by their promise to provide some more phenotypic data upon request. If you are aware of further DNM1 patients, please let me know, as well! Furthermore, the list of enriched genes included PURA and TRIO, genes that were previously found in patients with epileptic encephalopathies. Most of the other genes (COL4A3BP, PPP2R5D, ADNP, POGZ, PPP2R1A, DDX3X, CHAMP1, BCL11A and PCGF2) were previously found in at least one of the large studies on autism or intellectual disability, reinforcing the idea that many of these genes may eventually accrue sufficient evidence to be referred to as pathogenic. In fact, it might make sense to revisit the E2 data in a few months to see how the fraction of patients explained has increased – in the DDD(UK) study, adding these research genes led to an increase from 28% to 31% of patients with sufficiently explanatory de novo mutations. Single mutations. Let’s examine the DDD research list a bit further. On this list, we find a second patient with a de novo mutation in SNAP25 and a patient with a de novo mutation in SV2A. Both of them present presynaptic proteins, which are prime candidates. Likewise, the cohort comprises another patient with a de novo mutation in CNKSR2, and one patient with a de novo mutation in GABBR2, two patients with de novo mutations in KCNB1, and one patient with a de novo mutation in ZMYND11. This indicates that in fact the rate of patients explained through de novo mutations might still be higher. Recurrent mutations. In five otherwise unknown genes, the authors observed a clustering of de novo mutations at identical sites. If such a constellation occurs, usually a dominant negative or activating mechanism is invoked, and such a finding provides an interesting insight into novel candidate genes in the absence of otherwise strong supportive data for these genes. The five genes include PCGF2, COL4A3BP, PPP2R1A, PPP2R5D, and BCL11A. All genes point towards biological pathways that are still entirely unknown. This is what you need to know. 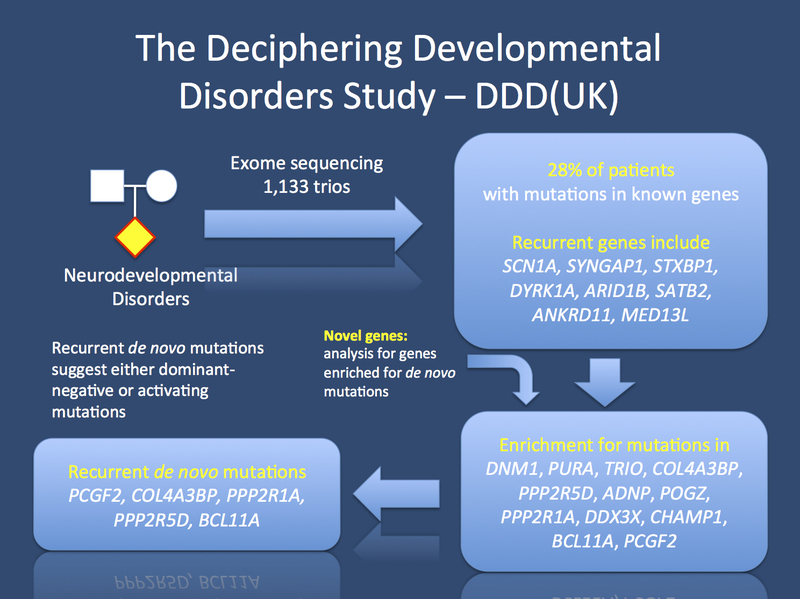 The DDD(UK) study offers us an interesting insight into the genetic architecture of developmental disorders, providing us with a 30+ percent hit rate when family-based exome sequencing is performed. The authors acknowledge that their study has somewhat hit the ceiling of what can be achieved on a national level and conclude their publication with an appeal for multinational collaboration to push the limit further. 10,000 trios will likely be the next milestone along the way. This entry was posted in 2015, autism, Bioinformatics, Consortia, Epileptic encephalopathy, Papers and tagged ADNP, ANKRD11, ARID1B, autism, BCL11A, CHAMP1, CHD2, COL4A3BP, DDX3X, Dynamin 1, DYRK1A, epileptic encephalopathy, intellectal disability, MED13L, PCGF2, POGZ, PPP2R1A, PPP2R5D, sanger centre, SATB2, SCN1A, STXBP1, SYNGAP1, Wellcome Trust. Bookmark the permalink.